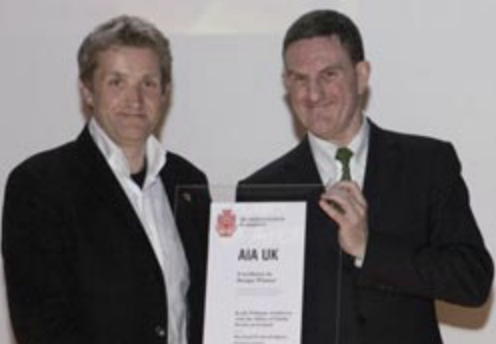 Keith Williams was last night presented with an AIA UK Excellence in Design Award for Wexford Opera House, by chairman of the AIA awards jury, Peter Rees City Planning officer at the City Corporation. The award was one of only 6 given this year by the AIA (American Institute of Architects) and is the 7th major design award that the opera house has won. The award ceremony took place at the Lillian Bayliss Theatre at Sadler’s Wells, London. Wexford Opera House was described by the jury as an exceptional insertion into Wexford’s historic skyline. The jury admired the skill with which this very large building has been embedded in the town such that from many angles it was barely noticeable yet from the waterfront its large scale has been successfully orchestrated through careful arrangement of its forms, resulting in a rich townscape composition alongside Wexford’s two Puginian church spires. Internally the scale and elegance of the main auditorium, which only revealed itself after entering a modest entrance door in a modest street, impressed, heightening the sense of drama on entering the building. Overall, the Opera House was noted as making an exceptional contribution to its urbanity whose designers had understood to a very sophisticated level how best to respond to the spirit and grain of its locale and its context.